Achieving smaller thighs takes more than thigh exercises. That’s because you can’t spot reduce any one area of your body. Combining cardio activity and toning exercises — along with a reduced-calorie diet — will help you achieve a thinner body as well as thinner thighs. You can use the treadmill to shed fat and achieve smaller legs. 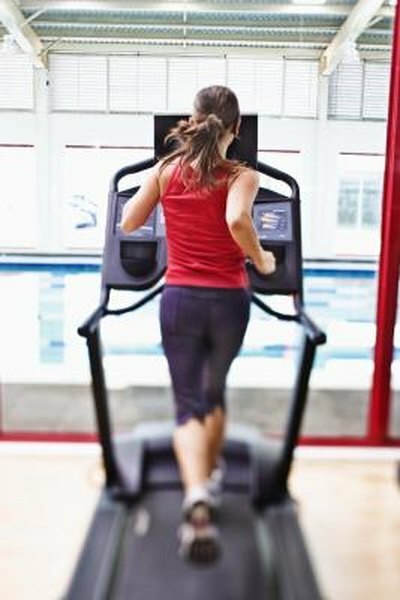 Selecting high-intensity activities for the treadmill will assist with losing thigh fat more quickly. The number of calories you shed on the treadmill will vary based on your workout intensity and weight. For example, if a 160-pound person walks 3.5 mph, she’ll burn about 277 calories an hour, according to MayoClinic.com. At this rate, you’ll lose thigh fat a little more slowly than with vigorous activities such as jogging. If you jog at 5 mph on the treadmill, calorie burning increases to 584 calories an hour. Running at 8 mph on the treadmill will bring calorie burning to 986 calories an hour. Another option for reducing thighs with the treadmill is a circuit-training approach. With this approach, you alternate intense cardio activity on the treadmill with toning exercises. For example, start with a thigh-toning exercise such as leg lunges for one minute. Then, alternate to one minute of vigorous activity on the treadmill, such as jogging or running. Continue to alternate a thigh-toning exercise and vigorous cardio for at least 30 minutes. If you aren’t sure which thigh toning exercises to use during circuit training, try leg circles. This exercise tones your thigh muscles. Lie on an exercise mat. Extend your left leg toward the ceiling, pointing the toe. Trace five circles with your toe. Change direction and trace five circles in the counterclockwise direction. Continue this rotation five times on each leg. Another thigh toning exercise is the squat with ball. Stand with your legs spread hip-width apart. Position an exercise ball between your lower back and a wall. Lower into a squat position. Hold the squat for a few counts and return to standing. Repeat this exercise eight to 12 times during your workout session.